For the past two weeks, while you were in the formidable hands of A.C., Bernie, and the authors of the Journal of Unlikely Entomology, I was high in the mountains of New Mexico, disassembling my stories and trying to build them back stronger and better than before. the plot of the next novel – cool, huh? 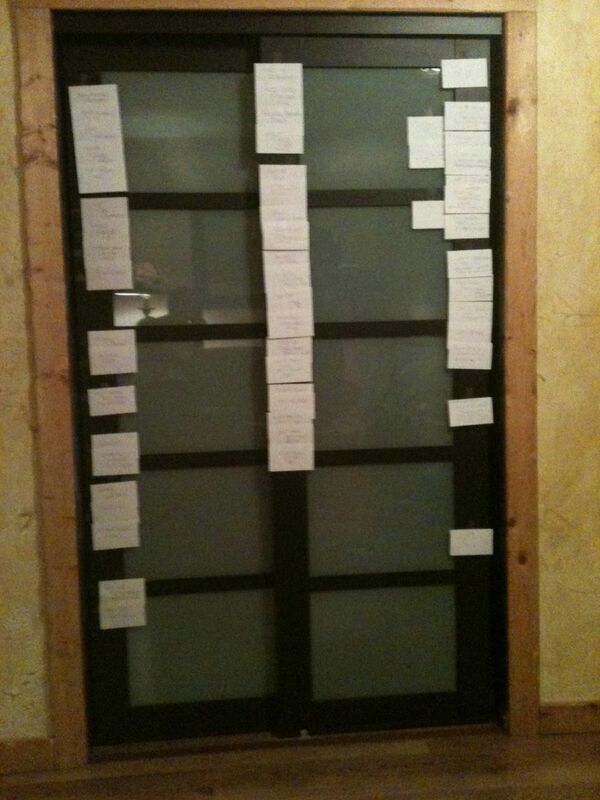 One magic moment at Taos Toolbox was when four of us sat up late one night and broke apart the plot of my novel, then reconstructed it on index cards taped to the closet door of my room. We added red cards for plot questions, then pulled them out when the question was answered.The next night we did the same for another student, and the third night, there were at least seven of us, crunching munchies and tossing plot questions to the author, who wove the results into an incredible new tapestry. That was pretty sweet! Many thanks to my fellow plot-breakers, Sara Mueller, Lauren Teffeau, Sandra Wickham, Cath Schaff-Stump, Chris East, Remus Shepherd, Lis Bass, and Rebecca Stephenson. Thanks to Walter Jon Williams for our introduction to this fabulous tool. I found having more eyes on my story arc the better — too often writing is solitary and it really helps to other people to bounce ideas off of, especially for a larger story and all the snares and holes and snarls plots are rife with. I know I benefited from your ideas, so I hope the same for you! absolutely – I loved talking this through with you! Very cool! Sounds like a hugely productive time! Thanks, David! Can’t wait to tell you all about it. I love that technique. We spent nearly every night during Kij Johnson’s KU novel writing workshop doing that sort of thing…writing in a communal room with the plots of our novels put up in post-it notes on the wall (different colors tracking different elements), and little groups of people branching off the brainstrom plot points, problems,etc. I’m sure it did awsome things for your plot! I’d seen it done with colored post-its, and heard of using colored cards. Colored cards makes it really, really easy to see where you might need more action, more reveals, etc; and you can hole punch them for a binder or put them all on a ring (method shown to me by Phyllis Radford). We substituted with colored ink, and it worked pretty well. Oh! Sara! Scott! I totally want you guys to meet each other! Sara, meet Scott! Scott, meet Sara! Family of choice = Awesome. I was just thinking that the next step in my editing process needs to involve index cards. Plus, your method sounds like a good excuse to buy pretty new pens with different colors of ink! I see some of this in our futures! we should certainly attempt it!